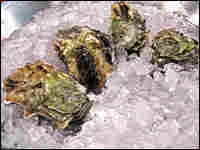 Exploring the Geography, Glories of Oysters More than any other food, oysters taste like the place they come from. Rowan Jacobsen, author of A Geography of Oysters, explains, describes and slurps his way through a sampling of succulent raw oysters. Rowan Jacobsen, author of A Geography of Oysters, says Belon oysters — also known as European flats — are the "Sean Penn" of oysters: memorable and intense, but perhaps too much for every day. Read about the 'dozen oysters you should know' and get recipes for a quartet of mignonette sauces. Kumamotos, with fine bony white ridges running lengthwise down their cupped black shells, are from the West Coast. 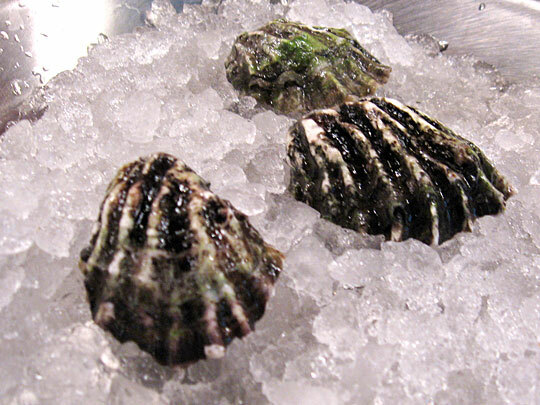 Author Jacobsen says Penn Coves from Washington state are the "sexiest" oysters he has ever seen: Scalloped shells protect creamy, white flesh inside. A platter of shucked oysters at Hank's Oyster Bar in Alexandria, Va.: Eld Inlet oysters from Puget Sound on top, Penn Coves on bottom. Olde Salts from Virginia are rugged-looking and briny-tasting. More than any other food, oysters have what author Rowan Jacobsen calls "somewhereness" — they taste like the place they come from. "With oysters, there are no intermediaries. 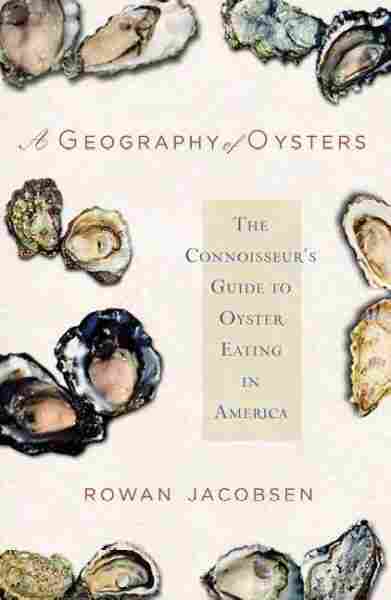 It's a very direct experience," says the author of A Geography of Oysters, a guide to oyster eating. "That food is exactly the same as it was when it was pulled out of the ocean," he says. "It's come to you on a plate somewhere and nobody's done anything to manipulate that food. In fact, the food was alive until just moments before." Rowan Jacobsen ate his first oyster when he was 12 — at Stormy's bar on Florida's Atlantic coast. They were a dime apiece at happy hour. Now, chances are one oyster will set you back at least $2. Jacobsen's enthusiasm for oysters, however, hasn't diminished. Take, for example, how he describes a temperamental mollusk in his book: "It is shamelessly bold. When it hits your tongue it slaps you awake like the opening blast of a bugler's reveille." Jacobsen is writing about a Belon oyster, also known as a European flat, which he calls the "Sean Penn" of oysters: memorable and intense, but not one you'd want to eat every day. During a recent visit, Hank's Oyster Bar just outside of Washington, D.C., has five kinds of oysters on the menu. And the restaurant has flown in a half-dozen more kinds — including some rare ones — for a tasting session. All of them were plucked from their beds just the day before. These oysters — like most sold in the United States — are farmed. Wild oysters fell victim long ago to overfishing and water pollution. Among the oysters for tasting are West Coast Kumamotos and Olde Salts from Virginia. "I'm picturing the Atlantic on a cold, gray, November day. It's like a shipwreck oyster," Jacobsen says of the Olde Salts. An oyster will filter up to 50 gallons of water a day, and will take on the flavors of that water: salty, mineral, mossy, smoky or metallic. Jacobsen is somewhat of a purist when it comes to eating oysters. "I've got no argument with a little, nice mignonette [a vinegar-based dipping sauce]. [Culinary pioneer] James Beard referred to cocktail sauce as 'the red menace,' and you can't argue with James Beard. ... I like them naked," Jacobsen says. He is equally opposed to the cocktail fork many restaurants offer for eating oysters. "I feel like the cocktail fork is a way of attempting to put a veneer of civilization on what's basically a pretty primitive act," Jacobsen says. "So, why pretend?" Next up for tasting are Penn Cove oysters from Washington state. 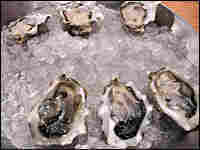 They are multiyear winners of the annual Most Beautiful Oyster Contest at Elliott's Oyster House at Pier 56 in Seattle. Jacobsen calls them the sexiest oysters he's ever seen. "They ... get bountiful and succulent, and they have this gleam to them as they sit in their shells," he says. "They just look incredibly healthy and vivacious." Jacobsen describes eating raw oysters as "kissing the sea on the lips." 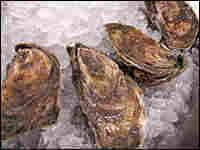 And of course, oysters are thought to have aphrodisiacal qualities. He says the anecdotal evidence to support that idea is strong. But he doesn't think it's for the reasons that people tend to think aphrodisiacs work. 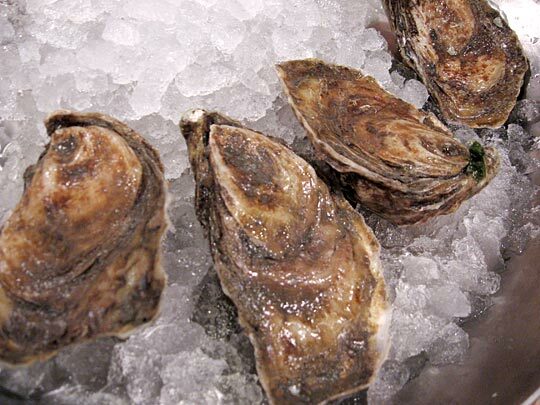 Many people point to oysters' high zinc content — zinc is needed to generate testosterone. But as Jacobsen points out, the second-best source of zinc is liver — not widely known as a mood enhancer. Instead, Jacobsen thinks the link has more to do with the culture of oyster eating, which is slightly risky behavior. "If you look around a bar, you see other oyster eaters, you know you've got some interesting characters there. "And you're feeling really good because you've got all this vitality that you've just taken from the sea and put into yourself. You're just feeling good about life and that can manifest in all sorts of ways," Jacobsen says. And as for another piece of conventional wisdom about oysters, Jacobsen does recommend sticking to the "r" rule: avoiding oysters from warm waters from May through August — the months without an "r" — both for safety and for taste. 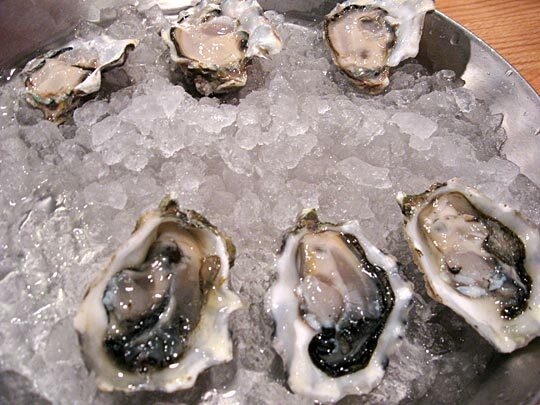 TO BE A full-fledged ostreaphile — an oyster lover — you can't just pound Kumamotos or Wellfleets all the time. You need to explore the full range of styles and varieties. Different oysters, after all, work best as beer accompaniments, culinary stars, or exotic curiosities. This alphabetical list of twelve prominent varieties provides a good representation of the classic types. These small oysters are grown in floating trays in the harsh New Brunswick climate. Always petite and clean-flavored, in classy black-and-white shells, Beausoleils make ideal starter oysters, with the delightful yeasty aroma of Champagne or rising bread dough. No oyster comes close to the power of the European Flat (often called Belon, after the famous French oyster of the same species). It is brassy, in every sense of the word. Brassy because it tastes like metal, and because it is shamelessly bold, and because when it hits your tongue it slaps you awake like the opening blast of a bugler's reveille. Try one if you can — just don't make it your first oyster. Light is a term often ascribed to PEI oysters. Sometimes it's a negative, indicating a lack of body and flavor. Sometimes, as with Colville Bays, it means transcendent. Colville Bays have plenty of body but also an addictive lemon-zest brightness. They are the oyster most likely to make you order another dozen. The dusky jade shells, when piled high, achieve the luminosity of moss on a rain-forest stump. Native Americans ate Damariscotta River oysters for a millennium, as the hill-sized middens along its upper banks confirm. The extremely cold, salty water produces slow-growing oysters with fantastic texture and brine at the upper end of the register.These are the soft pretzels of the oyster world, chewy and salty and heaven with a cold beer. The oyster that put the fruit back in fruits de mer. Kumamotos are famously melon-scented, sweet, and firm, with none of the bitter or muddy aftertaste that makes some oysters challenging. Closely related to the Pacific oyster, which also was imported from Japan, Kumos stay small and deep-cupped, and are revered by beginners and pros alike. Some of the most savory oysters in the world come from a geographical arc running from the eastern end of Long Island, along the ragged Rhode Island coast, to Block Island, Cuttyhunk, and Martha's Vineyard: the line marking the terminal moraine of the most recent glacier. Along that arc, mineral-rich waters produce salty oysters with unparalleled stone and iron flavors, of which Moonstone is the reigning king. An oyster from pristine waters. Ain't nothing on the Pacific side of Vancouver Island except orcas, sea lions, shellfish farmers, and the occasional kayaker. You know these oysters are clean, but clean waters do not necessarily make light-flavored oysters. Art-deco–patterned, lavender-flecked Nootkas, in fact, taste strong, with hints of muskmelon and a flavor of cold, slightly sweet raw milk — animal, but good. The only native West Coast oyster, once found from Baja to British Columbia, but now harvested commercially only in southern Puget Sound. These tiny celadon lockets hold delightful treasures: miniature oysters redolent of morels and butter and celery salt. Maddening to open, and maddeningly good. Gorgeous, ruffled shells holding consistently plump, white oysters with black mantles. Penn Coves are multiyear winners of the West Coast's Most Beautiful Oyster contest. They are a prime example of the "clean finish" style of Pacific oyster — light, salty, fresh, like a cucumber sandwich rolled in parsley. Famous as a Chesapeake oyster river for centuries. Of the twelve oysters on this list, Rapps are the quietest. Extremely mild oysters, exhibiting a simple sweet-butter flavor, they are easily overshadowed by saltier or fruitier oysters, so they don't fare well in mixed tastings. But on their own, with the most evanescent of wines, they can be delicacy itself — a lesson in the pleasure of minimalism. 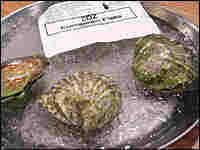 If Penn Coves exemplify the "light and lettucey" side of Pacific oysters, Skookums show Pacifics at the other extreme. These rich and musky oysters grow fat on the "algae farms" — mudflats — at the head of tiny Little Skookum Inlet, one of Washington's oldest oyster sites. The brown and green algae that thrive on the mudflats, different from deep-water algae species, give Skookums an aroma of trillium and river moss, more earth than sea. The oyster that begs the question: Nature or nurture? By nature, it's a virginica, the East Coast oyster, celebrated for its superior texture. But it's nurtured in the gentle algae baths of Totten Inlet, famous for producing full-flavored Pacific and Olympia oysters. The result is an unlikely yet dazzling mutt — fat and round on the tongue, but cleaner and more mineral than a Pacific. 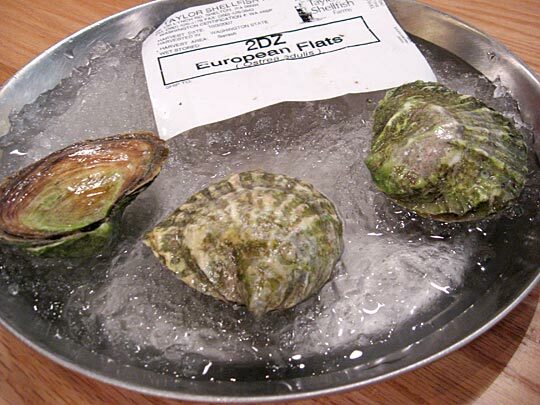 If you prefer the Totten Virginica to Pacific oysters raised in Totten Inlet, then chalk one up for the Eastern oyster. If you prefer Totten Virginicas to East Coast virginicas, that confirms Totten Inlet's revered status. 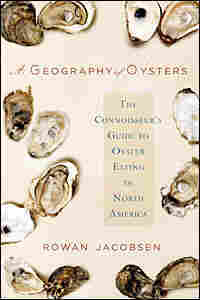 Excerpt from A Geography of Oysters by Rowan Jacobsen. Copyright (c) 2007 by Rowan Jacobsen. Reprinted by permission of Bloomsbury USA. MOST OYSTER COOKERY is misguided. Why take a delicate, fleeting flavor and disrupt it with heat? True, a few minutes of cooking can firm up their flesh and make them more palatable to oyster skeptics, but the makeup of oysters is such that, if they are cooked for any significant amount of time, the proteins link up into a tough, chewy little mass. Sure, if you cook them for several hours they will start to soften up again, but the same could be said about tennis balls. A common thread through most successful oyster recipes I've tried is that the oysters are handled incredibly gently — warmed more than cooked. I believe that any oyster recipe should face two screening processes before it makes it into your kitchen. First: Would the oysters be preferable raw? If so, toss the recipe. Second: Would the dish be better with something other than oysters? If clams, scallops, or even shrimp would be as good, or better, why not save the oysters for one of the roles for which they are uniquely suited? The following recipes are a few that I think do capture the gestalt of oysters, in very different ways. In all of them, the quality of the oysters is crucial. It may be tempting to use those pop-top tins of preshucked oysters sold in every supermarket, but they will ruin any dish with their tinny flavor and rubbery texture. I was thirty-four years old when I discovered I'd been using the wrong part of the lemon my whole life. Lemon juice is fine to brighten a drink or a piece of fish with a shot of acidity, but everything that is floral and piquant about lemons is found in the zest — the grated peel, which contains the aromatic oil. Mignonette — red-wine vinegar spiced with shallots and pepper — is the classic French sauce for oysters, but I find citrus superior. Because it has only half the acidity of vinegar, it is less overpowering, and it has sweet and floral touches that mingle with oyster flavors better than harsh vinegar does. A simple trickle of citrus juice on an oyster is good, but creating a mignonette of juice, zest, shallots, and pepper is superb. Any acid will counteract saltiness (think malt vinegar on French fries), so citrus and mignonettes help to balance overly briny oysters. They also enliven a dull oyster. They do obliterate a certain amount of the fresh oyster flavor, so I prefer nothing on the best oysters. On the other hand, they alter full-bodied, high-umami oysters in a way that makes them much more successful with wine, particularly floral wines like Sauvignon Blanc. Providing a range of mignonettes, such as the following quartet, excites people to explore — always the sign of a good party. Roger Tory Peterson describes a purple finch as "like a sparrow dipped in raspberry juice." Well, a blood orange is like a tangerine dipped in raspberry juice. The color and the flavor are clearly and distinctly raspberry. That makes for a delightful mignonette. You could puree actual raspberries with tangerine juice to achieve somewhat the same effect, but you wouldn't have the sharpness provided by blood oranges. Mix all ingredients in a nonreactive bowl. Serve immediately. Meyer lemons are crosses of mandarins (tangerines) and lemons, but somehow the cross created an herbal perfume missing from either parent. You can smell it right through the thin, orange-yellow skin — a scent like wandering thyme-carpeted paths in an orange grove — and it drives me wild. As you'd expect, it makes a spectacular mignonette. The woodsy liquorish flavor of tarragon is terrific with oysters, and tarragon vinegar is widely available, making this mignonette a snap. You can reduce the harshness of the vinegar, and increase the complexity of the flavor, by cutting it with a tart white wine such as Sauvignon Blanc, Chablis or Muscadet. The Japanese are serious oyster fans. I've combined some typical Japanese ingredients to create a mignonette that screams out to be paired with oysters and a glass of ice-cold sake. Virtually all the wasabi in the world is actually horseradish with green food coloring. Real wasabi is incredibly rare but vastly superior. It has less kick than faux wasabi, but a fascinating suite of fresh, green, peppery flavors. Outside of Japanese mountain streams, it is grown only in New Zealand and British Columbia. If you can find the fresh root, and pair it with equally fresh British Columbia oysters, you are in for a real treat. When you plunk yourself down at the bar at Elliott's, on the Seattle waterfront, and order some oysters, you will be presented with a single sauce: their signature Iced Champagne Mignonette. Nothing else compares. By transforming a mignonette into a granita by carefully freezing it, you get a sauce that obediently stays atop its oyster. And the ice crystals serve as tiny flavor capsules, bursting in your mouth with lemony tartness. 1. Combine all ingredients in a bowl and place the mixture in a shallow pan so it is only 1 inch (2.5 cm) deep. 2. Place the pan in the freezer. Every half-hour, until it is completely frozen, agitate it by scraping with a fork to break up the ice crystals. The final product should look like shaved ice. Keep covered until serving. Reprinted by permission of Bloomsbury USA. Copyright (c) 2007 by Rowan Jacobsen.